When doing financial modeling, one of the first things to look at is if your empirical work makes sense. In other words, are there valid economic reasons why a model should work? This can help you avoid drawing erroneous conclusions based on creative data mining. Next, you should look for robustness. This can take several forms. One of the most common robustness tests is to see how well a model does when applied to somewhat different markets. Even though equities have offered the highest risk premium, it is desirable to see a model do well when it is also applied to other financial markets. Another robustness test is to see if a model is consistent over time. You do not want to see success based on spurious short periods of good fortune. You would like to see a model hold up well over a range of parameter values. Getting lucky can be good in some things, but not in financial research. Relative and absolute momentum have held up well according to all the above criteria. 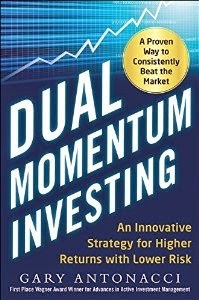 But now that momentum is attracting more attention, it is important to remain vigilant and to keep robustness in mind. What makes this especially true is the natural tendency to come up with modifications and "enhancements" that can add complexity to a once simple model. An interesting new paper by Dietvorst, Simmons, and Massey (2015) called “Overcoming Algorithm Aversion: People Will Use Algorithms if They Can (Even Slightly) Modify Them,” shows that people are more likely to adopt a model if they can change it. Giving people the freedom to change a model makes them feel more satisfied with the forecasting process, more tolerant of errors, and more likely to believe that the model is superior. Everyone likes to feel that they have some involvement with and control over a model. and that they may have made it better. Data mined “enhancements” may fit the existing data well but not hold up on new data or over longer periods of time. I have seen dozens of variations and "enhancements" to momentum, and I will surely see many more in the days ahead. One variation that attracted considerable attention a few years ago was by Novy-Marx (2012). He found that the first six months of the look back period for individual stocks gave higher profits than the more recent six months. This became known as the “echo effect.” But it never made much sense to me. So I tested the echo effect on stock indices, stock sectors, and assets other than stocks. I was not surprised when incorporating the echo effect gave worse results than the normal way of calculating momentum. 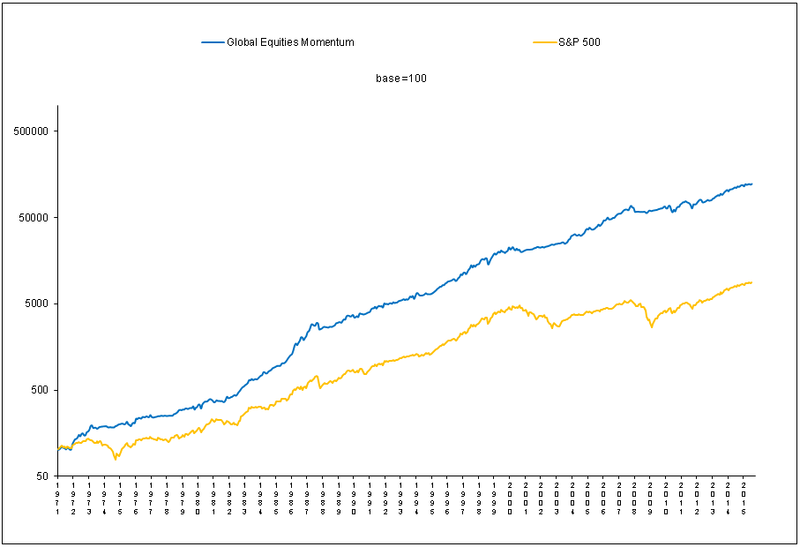 When I first developed the dual momentum based Global Equities Momentum (GEM) model, my back test went to January 1974. This is because the Barclays Capital bond index data I was using began in January 1973. I am now able to access Ibbotson bond index data, which has a much longer history. My GEM constraint has now changed to the MSCI stock index data going back to January 1970. This bond data gives me another three years of out-of-sample performance for GEM. My new back test includes the 1973-74 bear market and shows dual momentum sidestepping the carnage of another severe bear market. GEM is more attractive than it was before on both an absolute basis and relative to common benchmarks. Here is summary performance information from January 1971 through July 2015. 60/40 is 60% S&P 500 and 40% Barclays Capital U.S. Aggregate Bonds (beforeo January 1976, Ibbotson U.S. Government Intermediate Bonds). 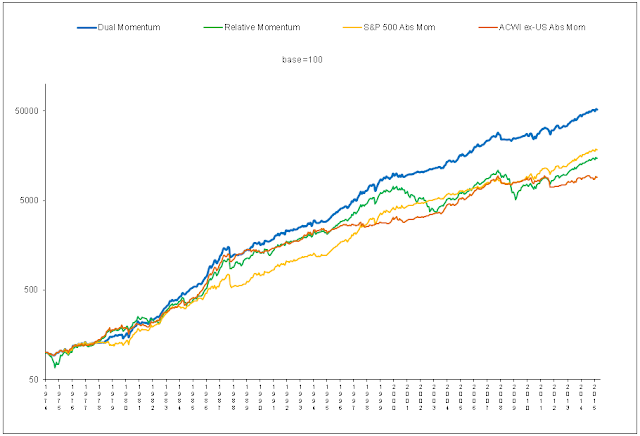 Monthly returns (updated each month) are on the Performance page of our website. Results are hypothetical, are NOT an indicator of future results, and do NOT represent returns that any investor actually attained. Indexes are unmanaged, do not reflect management or trading fees, and one cannot invest directly in an index. Please see our website's Performance and Disclaimer pages for more information. In a later article, we will look at longer out-of-sample performance using the world’s longest back tests. These further validate simple relative and absolute momentum. For example, between 1978 and 2008, U.S. stocks had an annual return of 13.9% when a U.S. model was on the cover of the annual Sports Illustrated swimsuit issue versus 7.2% when a non-U.S. model was on the cover. Short term mean reversion is not an issue with stock indices or other asset classes, so the last two months do not need to be excluded from their momentum look back period. See Geczy and Samonov (2015). Discovery of two month mean reversion is an example of the Fleming effect in which different but related research can lead to serendipitous results.